newborns | Live Healthy S.C.
Columbia, SC (WLTX) The South Carolina Department of Health and Environmental Control (DHEC) received a report of a confirmed case of measles in a resident who lives in Georgetown County on Friday, August 10, from a local healthcare provider. DHEC has begun a contact investigation and is notifying people who may have been exposed in specific settings. School starts soon in York Co. Is your child protected against contagious diseases? ROCK HILL – Cases of hand, foot and mouth disease have been popping up in York County. But that’s just one of several contagious diseases parents should watch for as school starts Aug. 20. Parents also should also be mindful of pink eye, respiratory infections and other illnesses that are easily transmitted in a school setting, said Dr. Arash Poursina, infectious disease specialist for Piedmont Medical Center. “As school starts, we do usually see a spike in the number of upper respiratory infections,” he said. A recent USA Today story called attention to the fact that the United States is falling behind other developed nations with an increase in maternal mortality. For South Carolina’s hospitals, our top priority is to implement a “Zero Harm” culture at our facilities, focused on providing the highest quality care to the patients we serve. That’s why we are committed to working with stakeholders to improve maternal health in our state. This entry was posted in Maternal & Child Health, Prevention, Public Health and tagged contagious, DHEC, disease, food and mouth disease, hand, health care, illnesses, infectious, maternal, measles, mortality, mothers, newborns, provider, SCDHEC, South Carolina Department of Health and Environmental Control, Zero Harm on August 13, 2018 by SC DHEC. The first year of life for newborn babies are exciting and scary. As proud new moms and dads fawn over their bundle of joy that joy is tempered by the loss of sleep and a fear of losing their child to some illness, accident or other condition. Infant deaths are a great concern for our country and the world. Its impact on families and society is devastating. DHEC annually collects data to monitor infant death rates across South Carolina. South Carolina’s infant death rates from 2006 to 2016 have dropped 16 percent. The positive trend in reducing infant deaths is due to the work of DHEC staff, our public health partners, parents, and doctors. Some of those partners are the S.C. Hospital Association, PASOs, and the March of Dimes South Carolina Chapter. DHEC also conducts education campaigns and support programs to address prenatal and post-natal care for infants. These campaigns, programs, and initiatives are vital in keeping S.C.’s babies from becoming a death statistic. These efforts are critical and on any given day, things can go wrong and they can go wrong quickly. New and first-time mom, Angelica Smith, is familiar with how the routine can quickly turn into an emergency. It happened March of 2016 when a DHEC newborn home visit nurse, Ann Gordon, went to visit the new mom and baby at their Cherokee County home. Ann was talking with the family when she noticed Angelica had a strange look on her face as she held baby Jacob. “I looked at him and noticed that his face had started turning blue,” Angelica Smith said. Thanks to this DHEC program and Ann’s actions, little Jacob’s life was saved. DHEC is working with its partners to continue its progress in keeping even more of the youngest and most vulnerable alive. DHEC is determined to give every child in South Carolina the best chance possible for a happy and productive life. View the below video for a closer look at DHEC’s efforts to address infant mortality in our state. This entry was posted in Maternal & Child Health, Prevention, Public Health and tagged babies, Birth Defects, Cherokee County, DHEC, infant mortality, low birth weight, March of Dimes South Carolina Chapter, moms, newborns, PASOs, preterm birth, S.C. Hospital Association, SIDS, South Carolina, South Carolina Department of Health and Environmental Control on November 2, 2017 by SC DHEC. 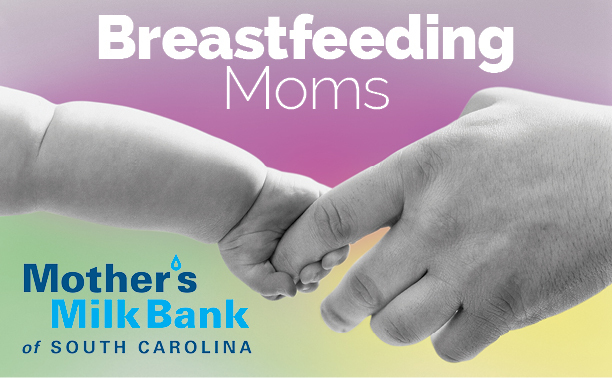 S.C. moms can now support other moms and premature newborns by donating breast milk to the Mother’s Milk Bank of South Carolina. The milk bank, which opened this spring and is the second of its kind in the Southeast, provides the perfect opportunity for healthy breastfeeding mothers with surplus milk to help babies in need. Mother’s milk is important for newborns, especially for premature, very low birth weight babies who are at higher risk for many serious health conditions. Sometimes new moms find it difficult to make enough milk for their premature, very low birth weight infants. This is why the milk bank was created by various partners including the Medical University of South Carolina, the S.C. Neonatal Consortium and the S.C. Birth Outcomes Initiative. Donated milk is distributed to hospitalized, very low birth weight infants statewide. The milk bank is currently housed at MUSC, and there are donation drop-off sites at DHEC health departments, as well as hospitals and pediatric clinics throughout the Palmetto State. Becoming a donor is easy. The Mother’s Milk Bank of South Carolina follows all standards established by the Human Milk Banking Association of North America to ensure safety and be recognized as an accredited milk bank. Each donor will be required to go through a screening process in order to meet these standards. Your milk could be delivered to a baby within one year of pump date. Learn more about how to become a donor at scmilkbank.org. For breastfeeding tips and more information about its health benefits, check out DHEC’s page. This entry was posted in Uncategorized and tagged Mother’s Milk Bank of South Carolina, newborns on July 2, 2015 by SC DHEC.